Be the first to share your favorite memory, photo or story of ROGERS. This memorial page is dedicated for family, friends and future generations to celebrate the life of their loved one. Rogers Leon Mackall known to all as "Curly", the son of the late Thelma and Charles William Mackall. Rogers was raised by his grandmother, Lula Sollers, and attended Calvert County Schools. He graduated from Brooks High School. 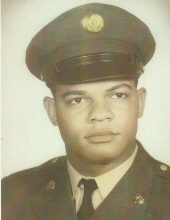 Rogers later went into the Military. Rogers worked many years for the Mayflower Hotel in Washington, D.C. He worked multiple jobs in the metropolitan area. Rogers Leon Mackall leaves to mourn two brothers, Glen Mackall (Dora), and Ray L. Mackall (Patty); two sisters Wanda Washington (Juarez) and Gwen Johnson (Jeff); one sister-in-law, Iris Mackall; beloved aunt, Shirley Gross (Kenneth); a host of nieces, nephews, cousins, and close friends. To send flowers or a remembrance gift to the family of ROGERS LEON MACKALL, please visit our Tribute Store. "Email Address" would like to share the life celebration of ROGERS LEON MACKALL. Click on the "link" to go to share a favorite memory or leave a condolence message for the family.